(http://search.creativecommons.org/) Overview Many choose to memorialize death with a living gift by sending flowers. While this soft and sweet gift option will certainly not take away the pain that the individual is feeling as a result of losing someone for whom he greatly cared, it can show him that he is not alone in his pain and that you are there for him during these trying times. Black Rose Few flowers look as sorrowful as black roses, likely making it no surprise that these blooms commonly represent death. By sending a black-rose bouquet to someone who has suffered the loss of a loved one, you can make your shared sorrow known. 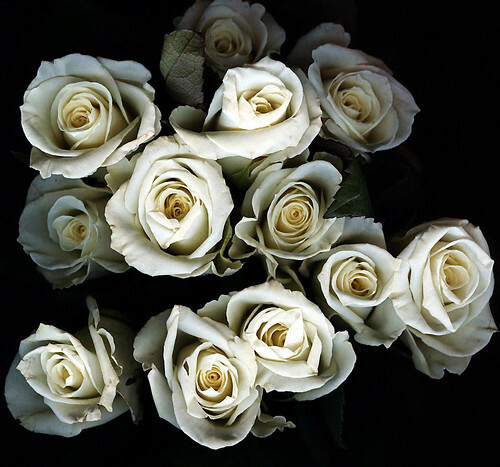 For an even more meaningful option, pair black roses with white, as these flowers symbolize unity, and the combination of the two can be seen as a representation of the fact that you feel united with the recipient in grief. Gerber Daisy While a Gerber daisy may seem a cheery flower to serve as a representation of death, is it often associated with passing as it represents thoughts of a lost friend. Selecting this floral option is an effective way to both recognize the death of a friend and remind the recipient to think about the good times despite how much the loss may hurt. For a subtle and sensitive option, try the Pretty and Precious bouquet from ProFlowers, which prominently features pink Gerber daisies along with peach carnations, pink tulips, white freesia and pink Hyacinth. Marigold Bold and brilliant marigolds are traditionally associated with, among other things, pain and grief. Sending a floral arrangement featuring these blooms shows your recipient that, while you can’t imagine how much she is hurting, you wish her well and hope she recovers quickly from this loss. Because these flowers bloom in the summer and often last into the fall, they are a wise choice when seeking a symbolically significant flower for a late summer or early fall passing. Statice Simple and elegant statice represents loss and sympathy. This floral option is clean and fragrant, making it a lovely floral gift for someone who has recently suffered a loss. Send a potted version of this plant, representing the fact that, while the loved-one has passed, parts of the individual live on, just like the live plant. Deep blue is a particularly appropriate color choice since it’s soft, muted nature makes it effectively sorrowful.